The memorial dedicated to emigrants who went on their journey from Ulm is located between Wilhelmshöhe and Danube bank, close to the Danube Swabian Central Museum. It was inaugurated on August 9th 1956 and commemorates the migration to south-eastern Europe in the 18th century as well as flight and displacement in 1945. It is an important memorial in Ulm, a city of symbolic power for the emigrants. The memorial created by Erich Koch is made of blocks of shell lime. On its front, a stylised ship can be seen and a man who protectively shields his wife. A small child sits on the woman’s lap. From the boat, a high cross emerges. The image is a reference to the flight of the holy family, a symbolism which can be found on many Danub Swabian memorials. The stele bears an inscription: “From Ulm, the settlers went on a journey on the Danube to southeastern Europe in the 18th century. Their offspring’s returned to their mother land after World War II, being displaced by fate.” Since 1962 the shore near the memorial is officially called Danube Swabian Bank. 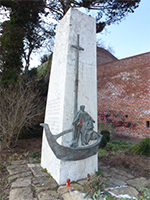 The memorial refers to three hundred years of migration, connections, flight and displacement and has become a part of the identity of Danube Swabians and the city of Ulm. As a place of commemoration it preserves the history within collective identity. The memory of Danube Swabians is kept alive. In May 2010, Ulm’s Lord Mayor, together with Swabians from Banat, laid a wreath at the memorial. In 2008, the association of Danube Swabians from Yugoslavia held an event at the memorial commemorating the 50th anniversary of displacement of Danube Swabians from Yugoslavia after World War II. The associations of Swabians from Banat and Satu Mare as well as Germans of Hungary regularly meet at the memorial to commemorate their past. The memorial functions as a focal point for community and memory of Danube Swabians. With its inauguration ceremony, Ulm turned into “the” pilgrimage place for Danube Swabians. 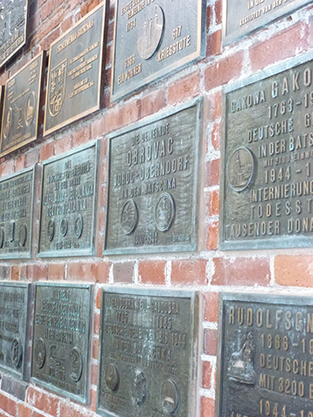 Many commemorative plates of different communities can be found along the Danube bank on the city walls. They remind the passersby of flight, displacement and deportation. On some of the bronze plates, images of other memorials can be seen. Inscription on the Danube Swabian Memorial. The bronze plates next to the memorial serve as a reminder of flight, deportation and displacement. 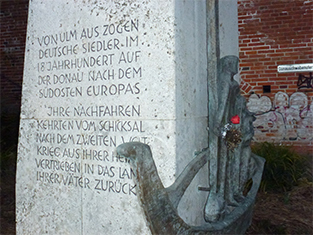 LEFT: The Danube Swabian Memorial is an important space of memory for the Danube Swabians. 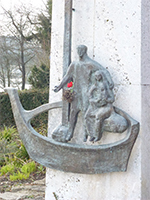 RIGHT: On the memorial’s front, a stylised ship can be seen and a man who protectively shields his wife. A small child sits on the woman’s lap. The memorial is located between Wilhelmshöhe and Danube bank close to the Danube Swabian Central Museum.